Romantic Fondue Party! Do You… Fondue? Who says a Valentine’s Day dinner must be reserved for only two? In fact, we think the beauty of one of the most special days of the year does not have to be solely dedicated to a pair of lovebirds, but can also be shared with friends and family! Our stylist Kathy thought the same thing when she planned this beautiful party for six! And why not? Who wouldn’t want to plan a party where prepping most of the food can be done on the day prior, with the main dishes consisting of savory cheeses, delicious wines, and decadent chocolate. 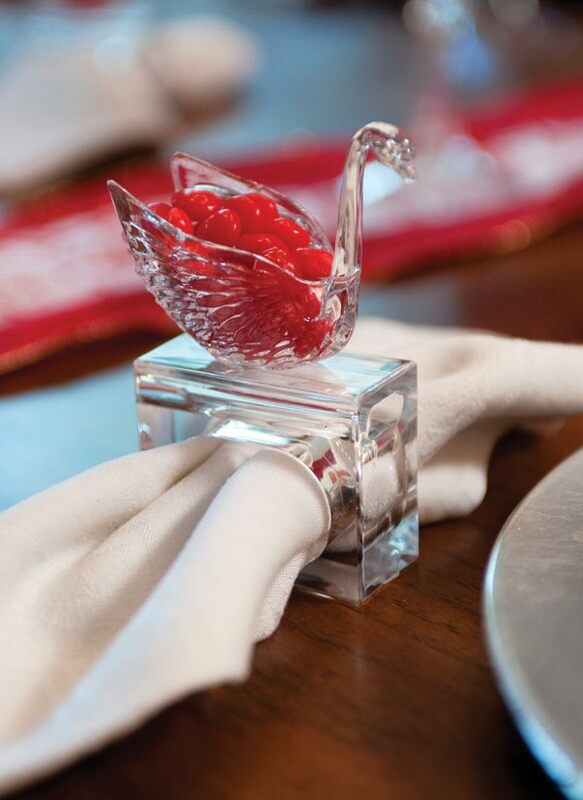 Best of all, your guests will have more fun than they would ever expect…eating! Are you wondering what type of party we are talking about? Fondue, of course! Traditional versions hail from Switzerland, where the concept was invented as a peasant dish to consume old cheese and old bread in a palatable manner. Any modern-day foodie would agree that it has become a fabulous way to consume delicious cheeses, chocolates, and other delectable tidbits… with little to no cooking experience necessary. No stale bread required! 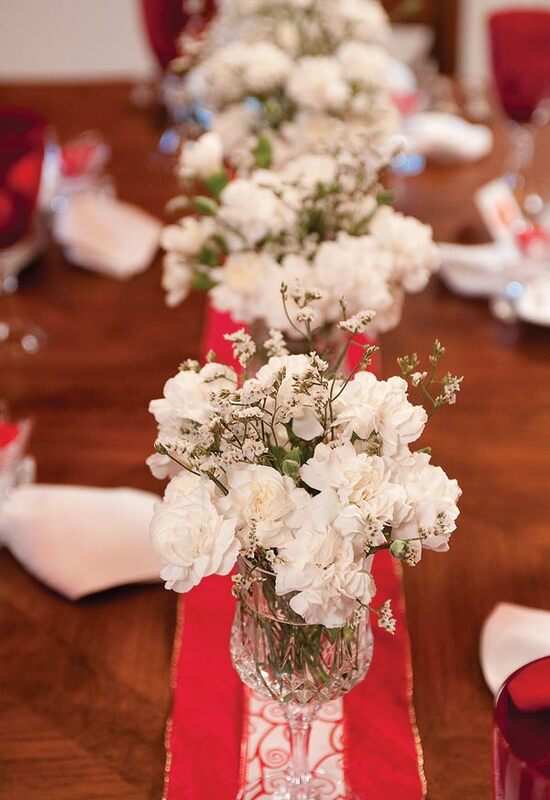 When it came time to design Kathy’s Valentine’s party she wanted a “no-fuss” décor which was simple yet inviting. With the color red playing the main character for the evening and lots of fun surprises along the way. 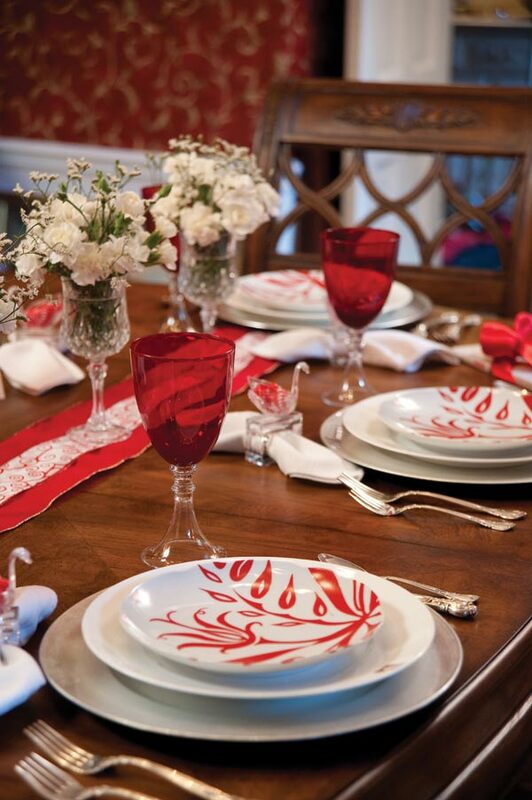 For a vibrant statement at the table, Kathy incorporated colorful red wine goblets and “funky bloom plates”. 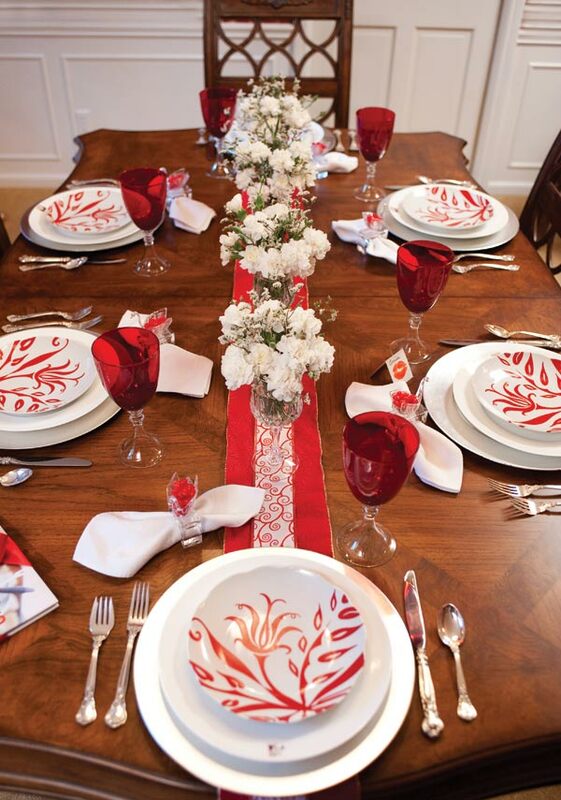 A few yards of red and white ribbon with a similar swirl to the plate’s pattern was spread atop a wide velveteen ribbon, creating a dazzling yet inexpensive table runner. Additional cut crystal wine stems were re-purposed as vases and filled with fresh white flowers to beautifully line the runner. To add a bit of whimsy in keeping with the impish spirit of the holiday, the place card for each guest was given a real smooch of lipstick. Furthermore, what is a fondue party without directions on doing it all over again? 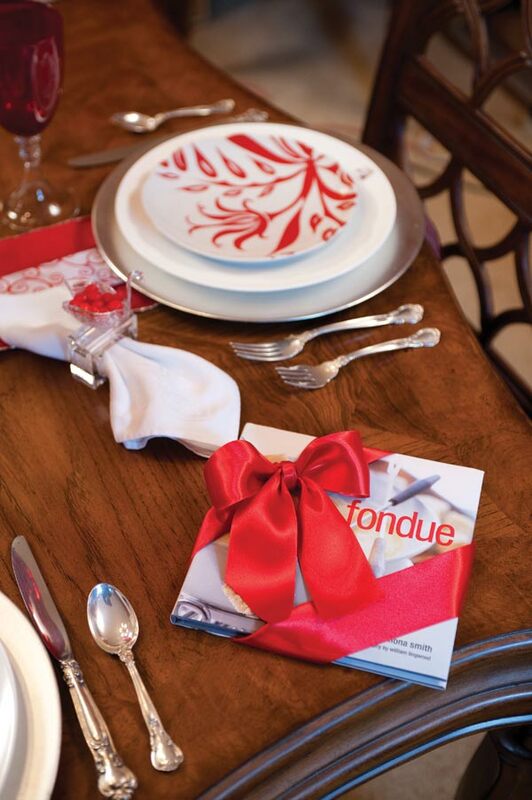 Each couple received a lovely fondue cookbook simply tied with a red satin ribbon, encouraging them to share the experience with their friends and family. Guests were greeted at the door with a taste of the sweet life. 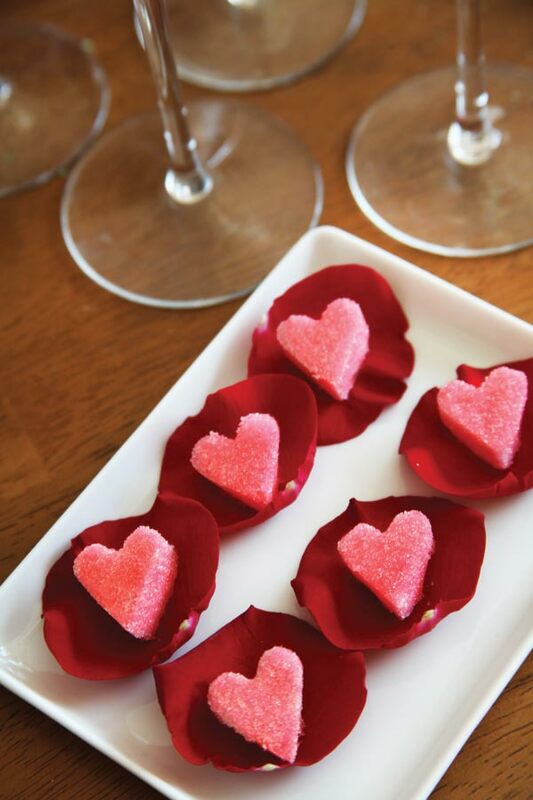 A glass of champagne garnished with a red rose petal was paired with a pink heart-shaped sugar cube to make the ultimate “welcome greeting”, the champagne cocktail! Once the sugar cube was dropped in, the champagne hissed and foamed, as well as tasting a little sweeter. For this party, the menu was simple: fondue au fromage for an appetizer, made with cheddar cheese and paired with hearty sourdough and honey wheat bread. Additional items for the guests’ dipping pleasure included tomatoes, celery, broccoli, carrots, cauliflower, mushrooms, avocados, spicy sausage, and roasted chicken. Although there is always more than enough food at almost any party, we recommend no more than six guests to each fondue pot for reasons of easy access to the dip if nothing else. The main course included a petit filet, garlic whipped potatoes and almond drizzled green beans. And then the real fun began! You’ll get no argument that the best fondue of all is the fondue au chocolat (chocolate fondue). And what better holiday on which to quench your thirst for chocolate than Valentine’s Day? So it’s no surprise that the highlight of the evening was the fondue au chocolat — a delicious pairing of heavy cream and melted chocolate. For those looking to save a bit on calories, whole or even 1% milk can be used in place of the cream, but the rich taste may be a bit compromised. The chocolate can be melted in a multitude of ways. A double boiler is probably the most traditional; however, we used the microwave on 50% power with good results, mixing the milk chocolate and cream together until the desired consistency was achieved. 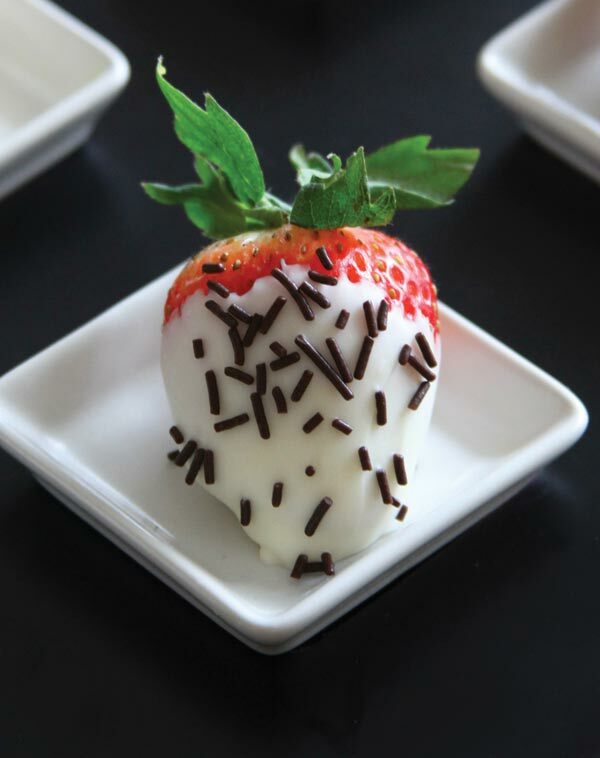 White chocolate may also be used, but be prepared for a somewhat thinner fondue, though still very tasty. 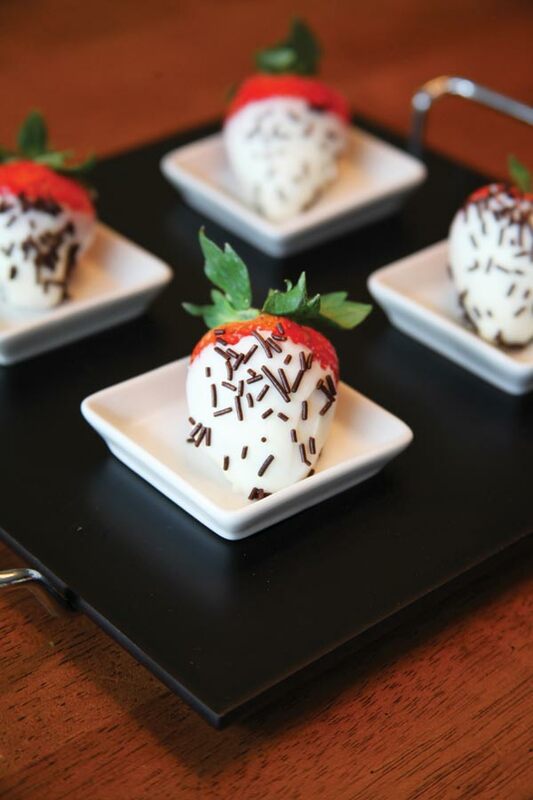 Don’t forget to include the white chocolate dipped strawberries with chocolate sprinkles. They should be refrigerated for 24 hours and are a great treat for guests who prefer some drip-free chilled chocolate in addition to the melted variety. Rose petals and hearts can be used as a pervasive design element throughout your Valentine’s evening. 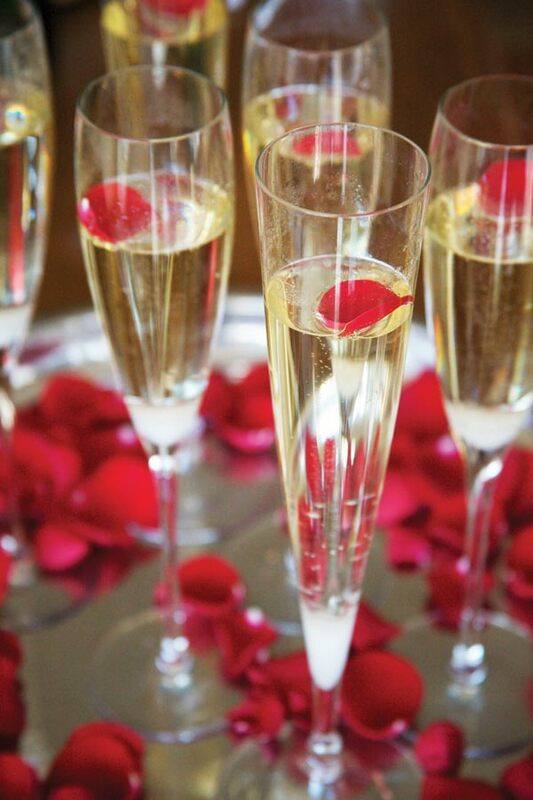 You can float rose petals in your champagne, as well as use them to garnish desserts. 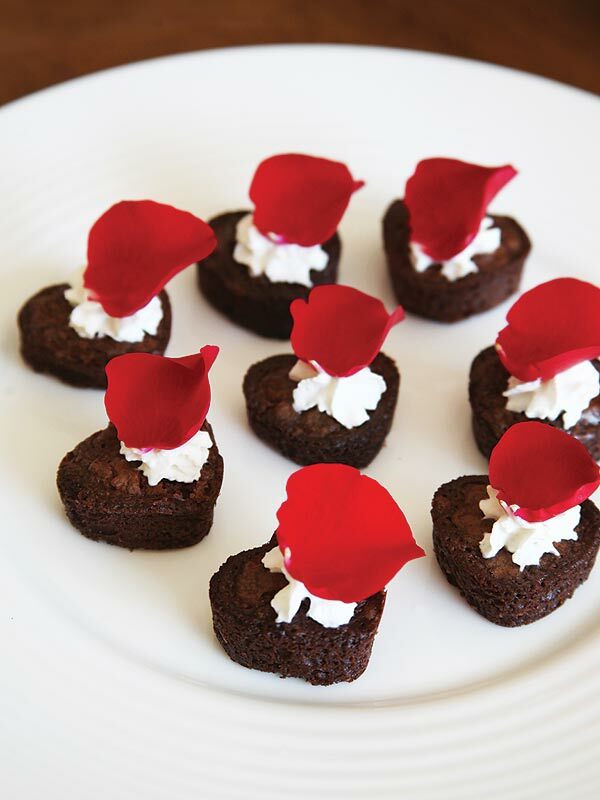 We garnished our mini heart chocolate brownies with rose petals that were floating on top of whipped heavy cream. For the ultimate Valentine’s treat, create heart-shaped sugar cubes and place them on rose petals next to your glasses of champagne for instant champagne cocktails. 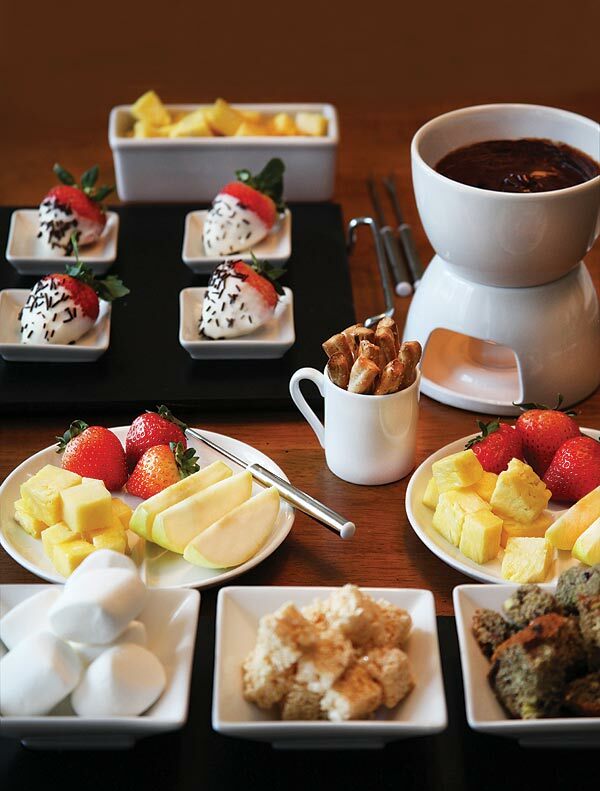 A fondue dinner is a beautiful and elegant experience. The communal atmosphere lends itself nicely to quiet conversation, lots of laughter, and contented silences while everyone enjoys a delicious meal. And best of all, it’s easy! 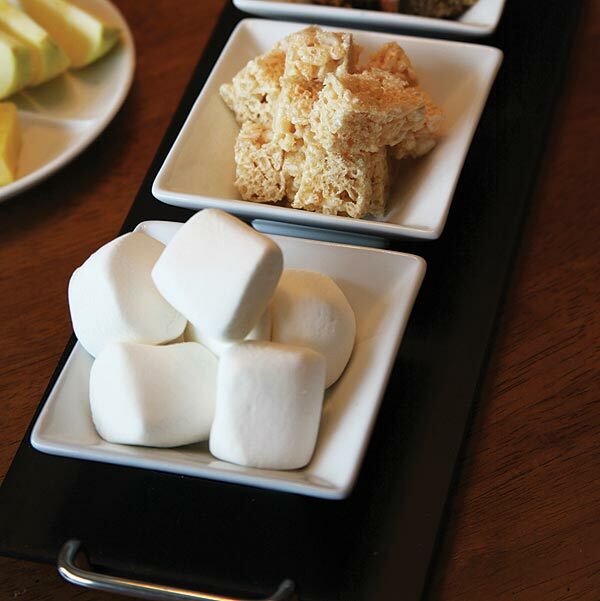 So don’t wait another minute and plan your Fondue Soiree today!